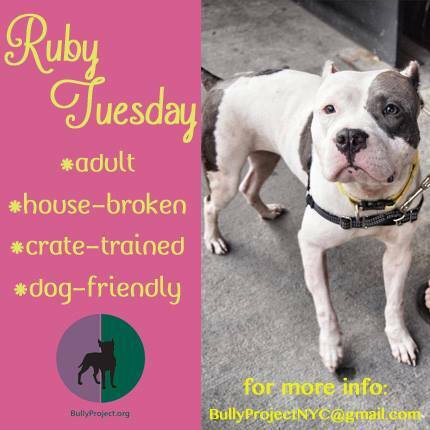 Adoptable Pittie of the Week: Ruby Tuesday! 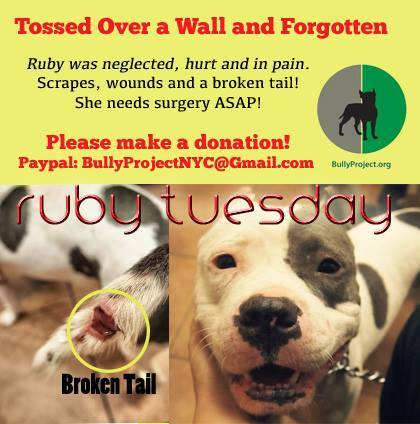 On Sunday, September 8th, Ruby Tuesday was thrown over an 8 foot tall fence into a churchyard. Two young men witnessed the incident from their apartment and took her in. She was hospitalized at our emergency vet, where she had surgery to amputate her tail, and was treated for infection and malnutrition, along with some other injuries. Although Ruby had a rough time, she is making up for lost time! She loves people! She likes dogs and is a great walker on the leash! Ruby is ready to roll and to be adopted. 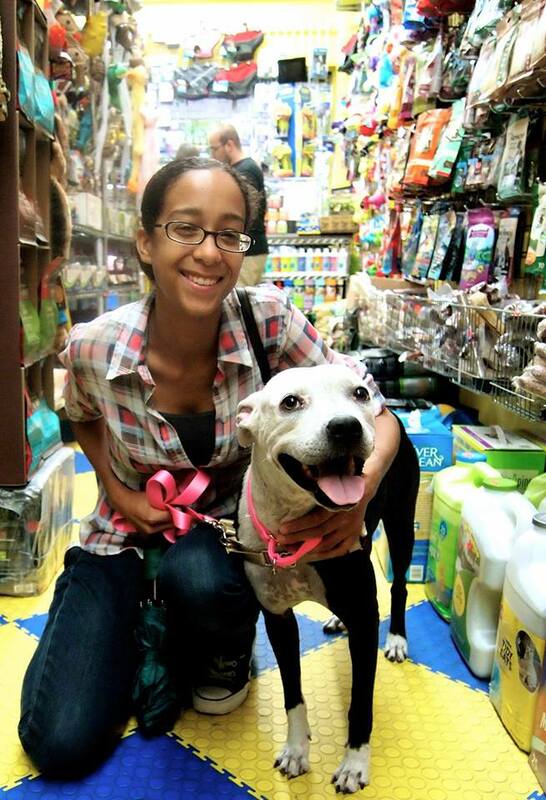 If you cannot adopt, you can make a donation to help cover her exorbitant medical care. 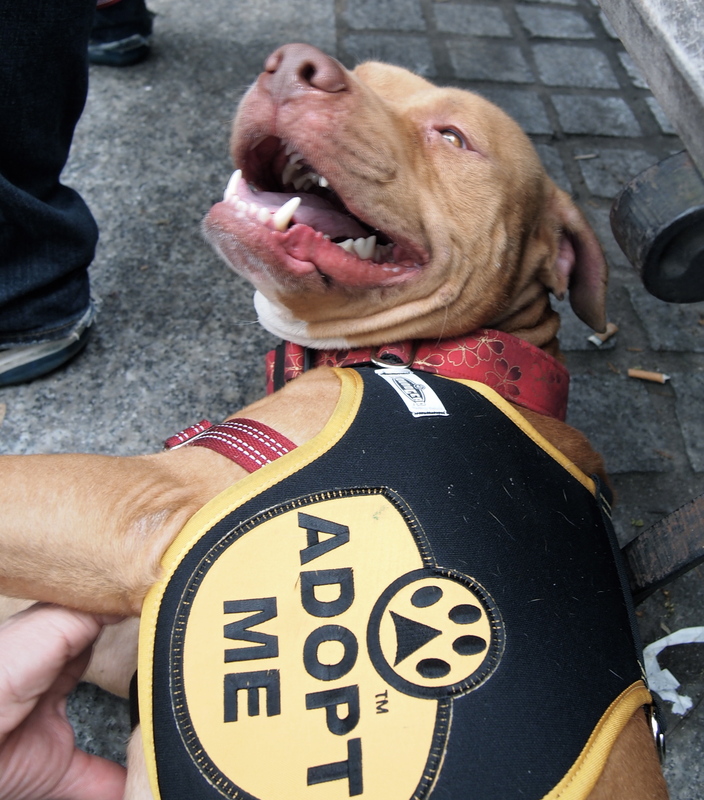 Please donate by visiting bullyproject.org or send a donation via PayPal to bullyprojectnyc@gmail.com. 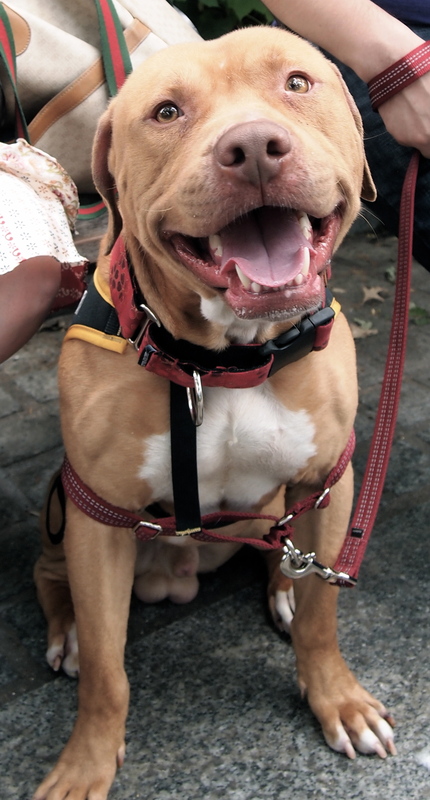 For more information about adopting this sweetie, please email us at bullyprojectnyc@gmail.com. Xena was originally purchased from a “breeder” at about two months old. 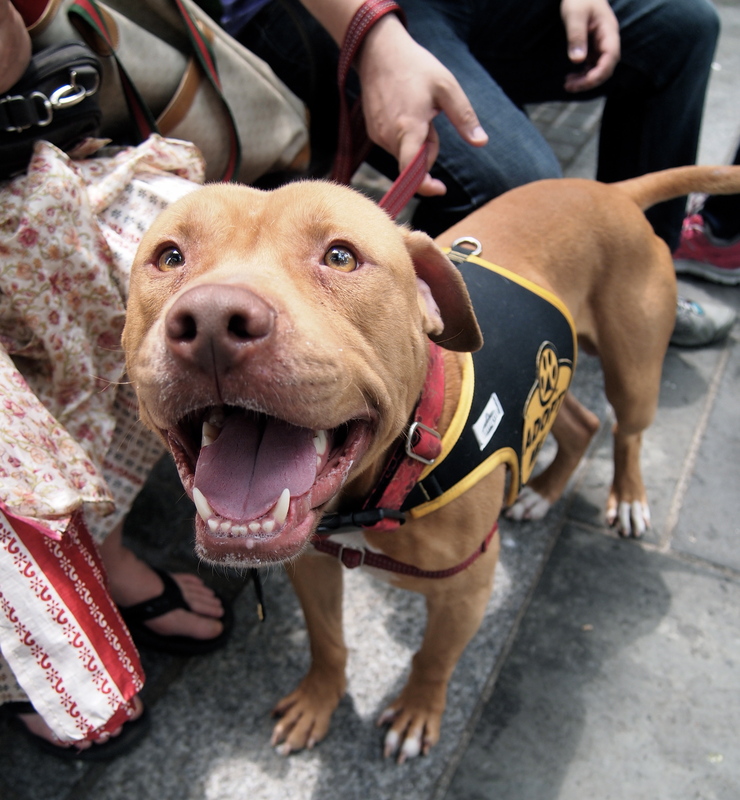 Her original owners couldn’t agree on whether she was allowed inside their home, so for nearly three months, she lived on their terrace with limited exercise and socialization. 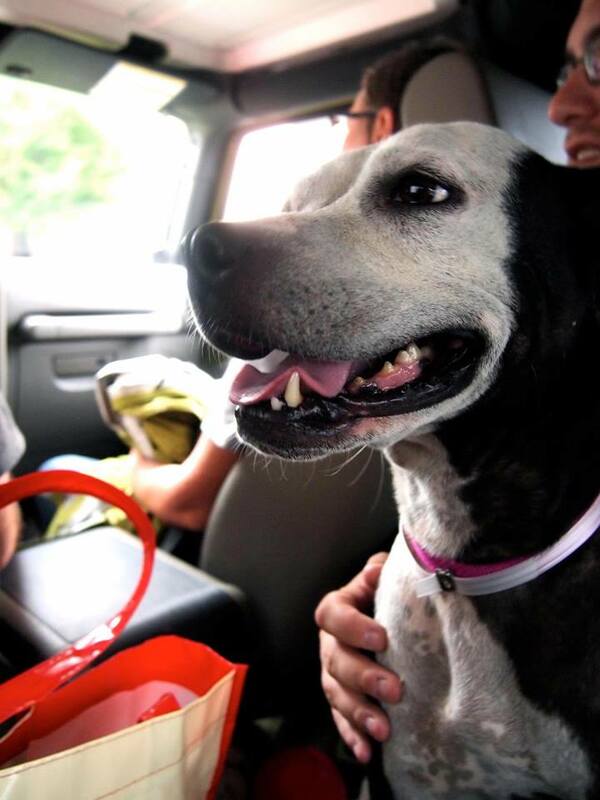 Her “grandma” frequently took care of her, and arranged all of her medical care and spay surgery, and realized she deserved to live a better life than what she had. 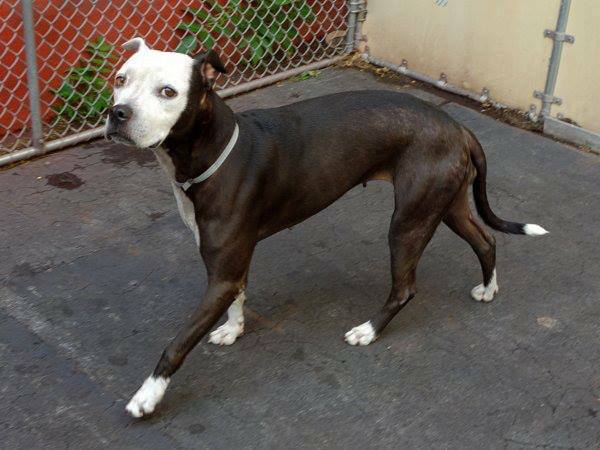 So, Xena was surrendered to our care! Despite her lack of socialization, Xena is the sweetest puppy around. 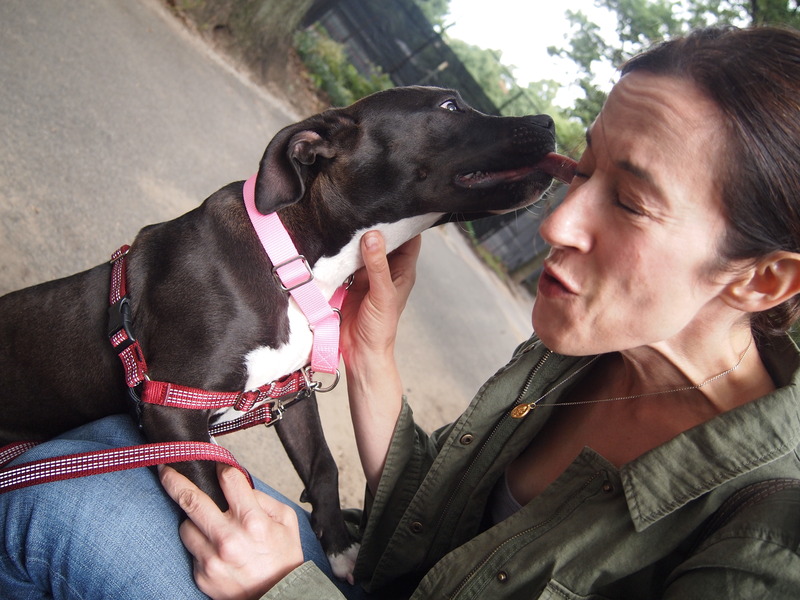 Friendly with all people, big and small, and other dogs, she continuously amazes us with her manners and obedience. She is about five months old and currently weighs approximately 30 lbs. 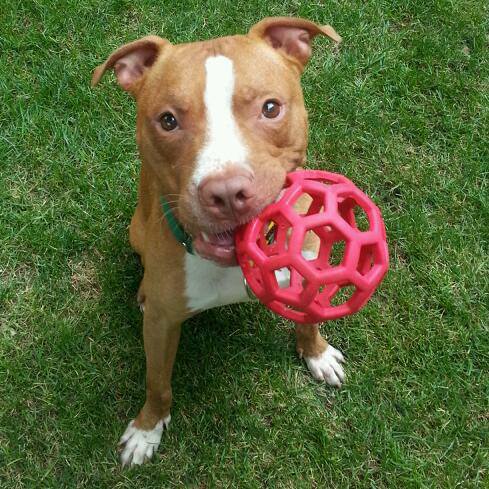 Any adopter must keep in mind that Xena is still a young dog. Therefore, she will need help learning to use the bathroom outside, and how to happily be in her crate while she’s home alone. But she’s super smart, so both of these tasks should be very easy to accomplish! 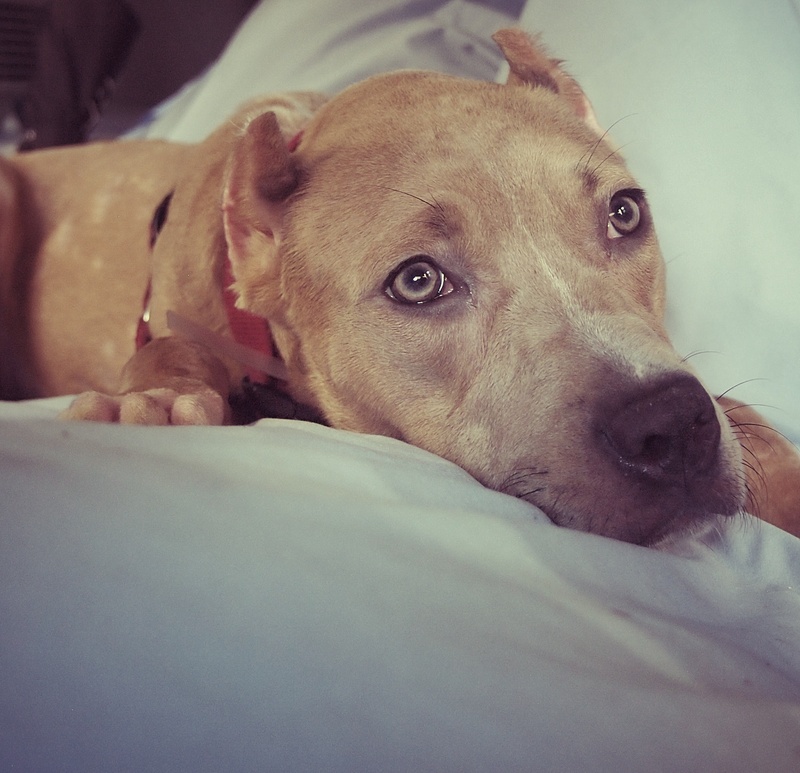 She is already fully vaccinated, microchipped and spayed and ready to find her forever home. 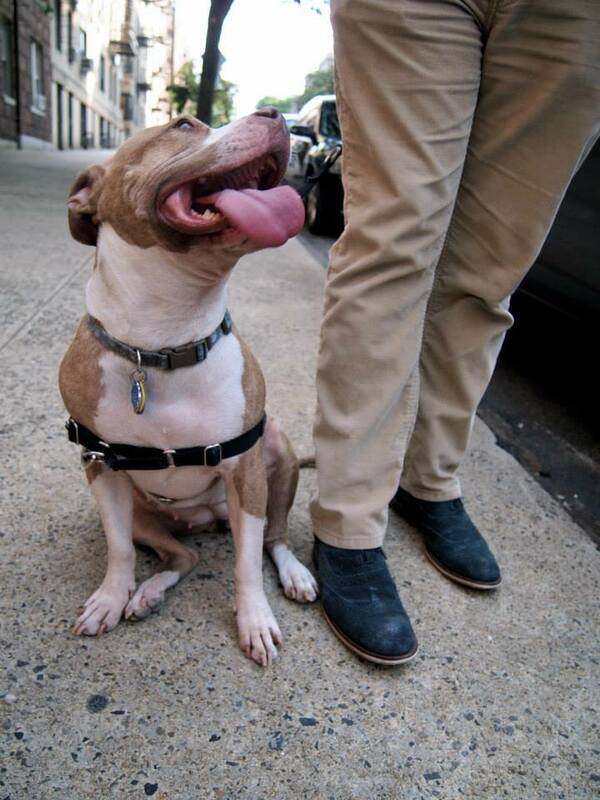 If you would like more information or want to apply to adopt Xena, please email us at bullyprojectnyc@gmail.com. Fondue is a two year old, 40 lbs bundle of pure love. 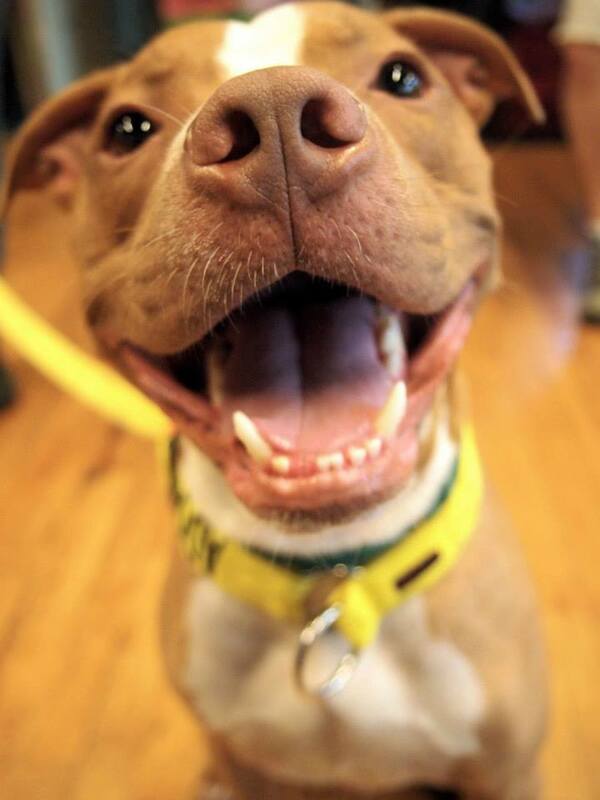 She’s an easy-going, mellow girl who lives for hugs and tummy rubs. She’s a bit shy at first but just give her some time and her personality will blossom. And although she’d spend all day on your lap if you’d let her, she’s not needy at all. She’ll be content to lay at your feet and keep you company while you work. This pretty girl has a great energy level; she’s very well-behaved and quiet indoors but can also be quite playful and energetic outside. 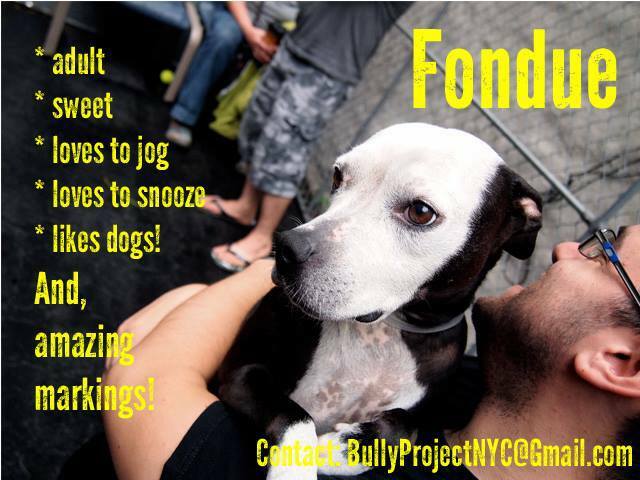 Fondue has energy to burn and would make a fantastic jogging or hiking partner. She can use some fine tuning on her leash manners but she is overall very easy and enjoyable to walk. Fondue is house-trained and should be walked three times a day to prevent any accidents. She is also fine with being left alone during the work day but would definitely appreciate a family or individual who isn’t gone for too long as she absolutely loves the company of other people. 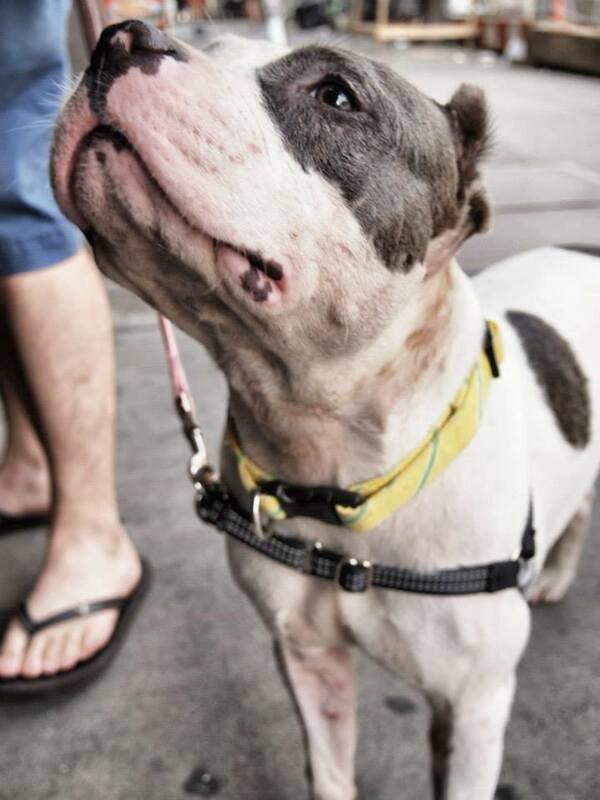 Available for adoption through Bully Project. 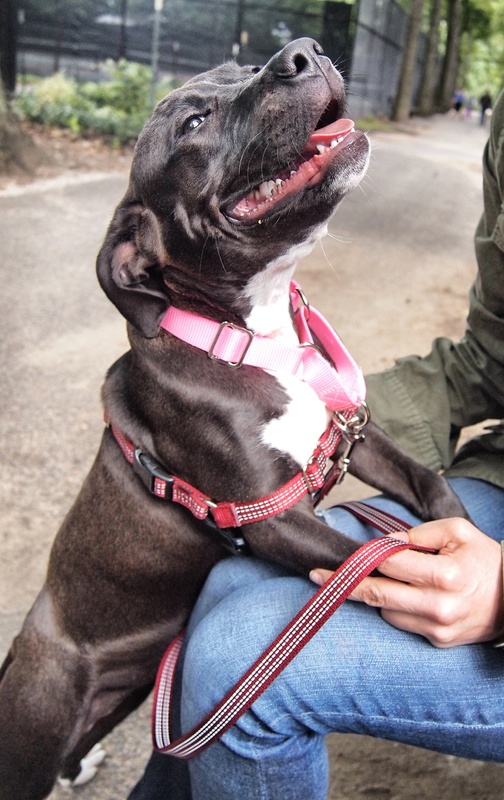 Email us at bullyprojectnyc@gmail.com for more information or to apply to adopt her. 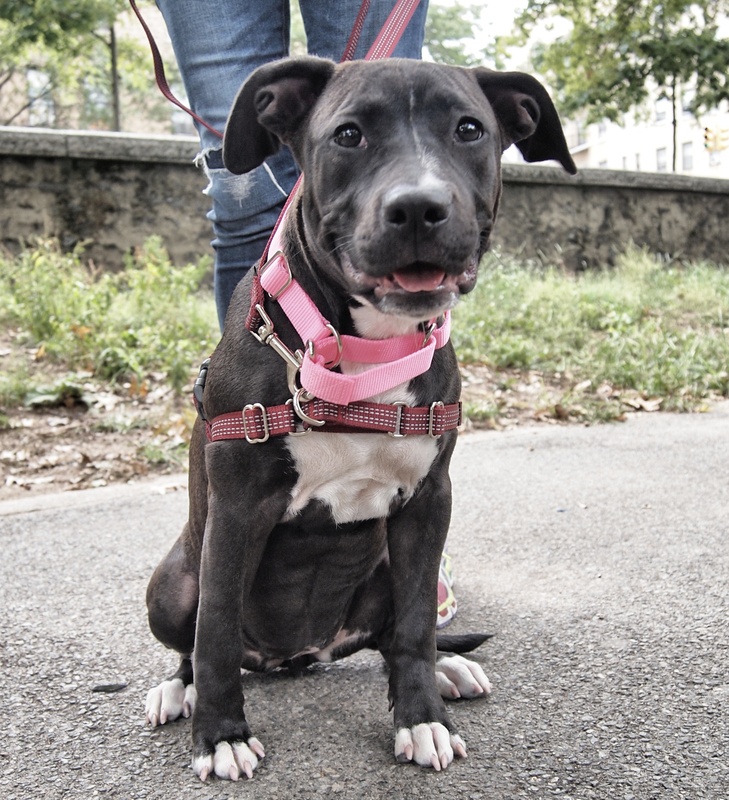 Little Betty is the true definition of a “pocket pittie.” At just a year and a half old, and fully grown at 35 lbs, she would be the perfect apartment dog! 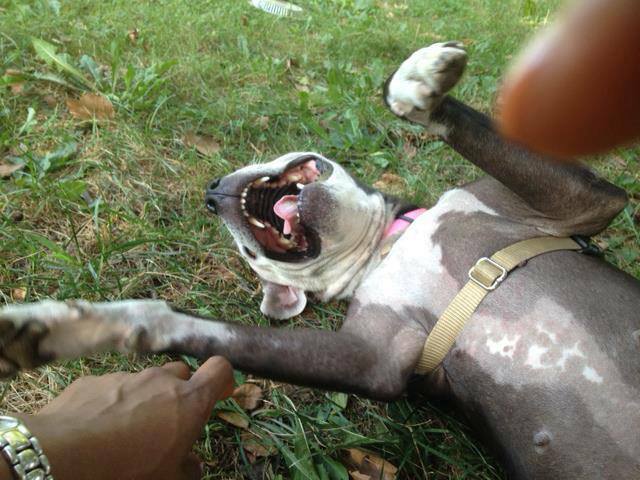 She is super friendly with all people and dogs, and is a joy to have around the house, according to her foster home. 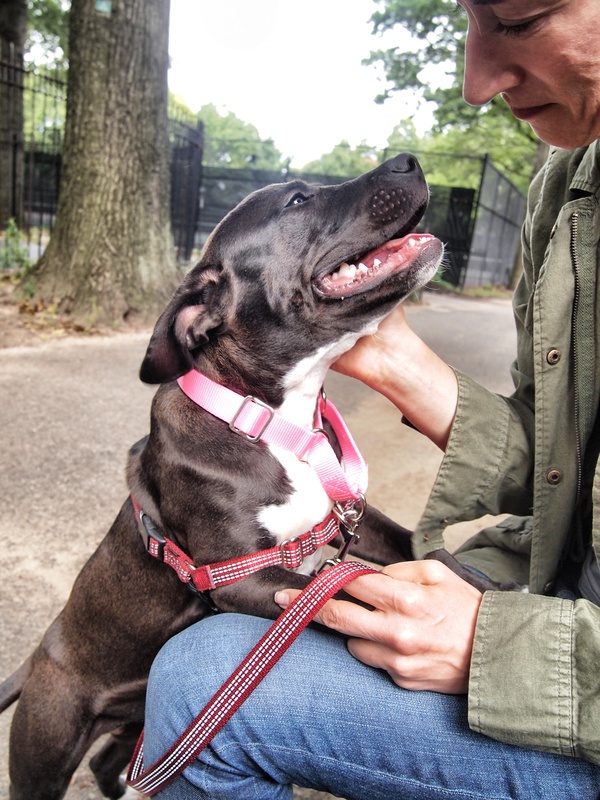 A professional trainer has been working with her to show her the polite way to walk on leash, as she pulls sometimes, but overall is a very well mannered and well behaved dog. She is already house trained and does very well alone at home. She is always calm, never anxious. She absolutely loves to play fetch, and loves snuggling even more. She’s whip smart and super food motivated, so teaching her a whole array of commands and tricks should be a breeze with this little girl. Betty is already spayed, vaccinated and microchipped. She’s ready to move right into her new forever home, as soon as they find her! 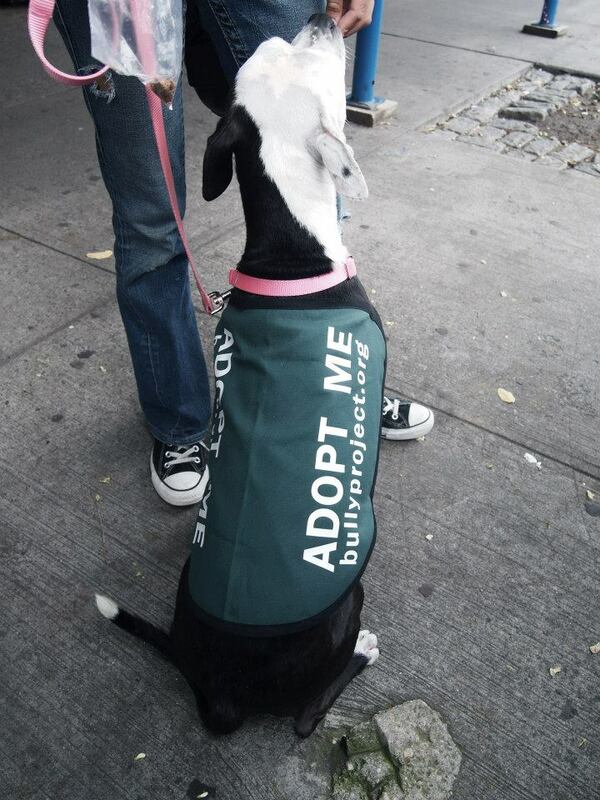 Email us today at bullyprojectnyc@gmail.com to find out more adopting her! 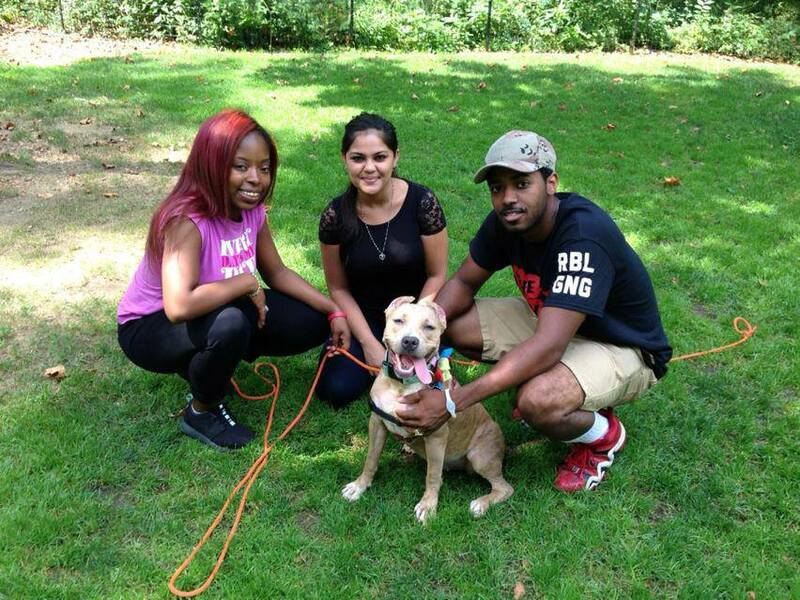 Tigger was rescued from a neglectful family, and now he needs a new forever home. 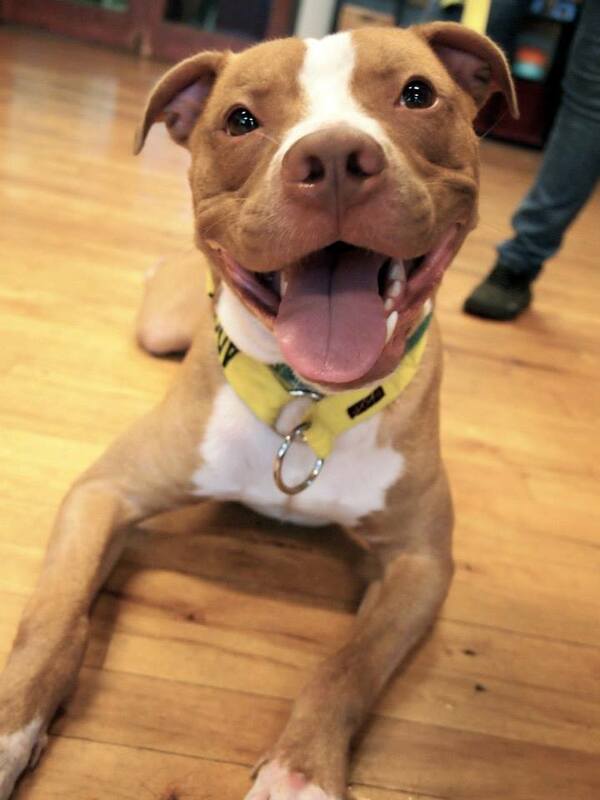 He is currently staying at a doggy daycare facility in New Jersey, and is attending training classes once a week. He is already housebroken, neutered, microchipped, and has all shots. 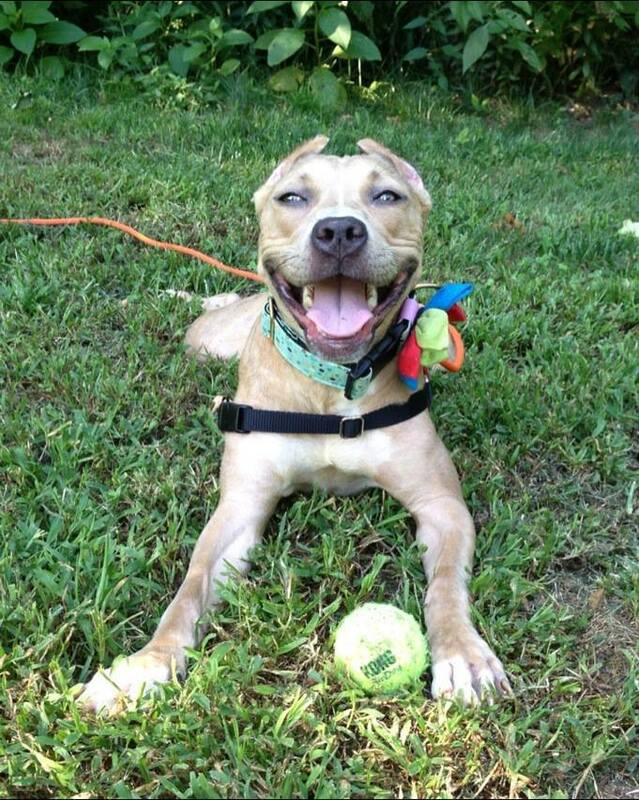 Tigger is a healthy, playful dog. 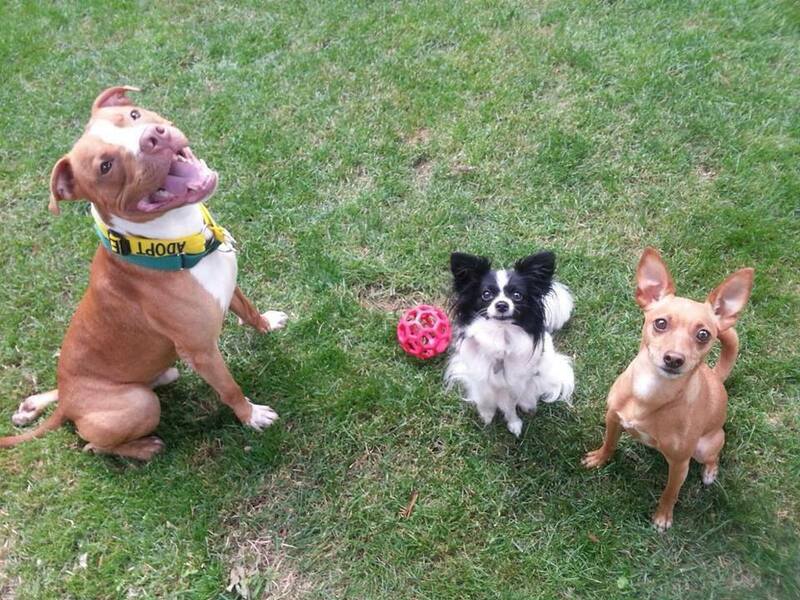 He is good with other dogs and children. Tigger is the perfect dog, however, he does have very slight separation anxiety. He wasn’t given any attention by his previous owners. 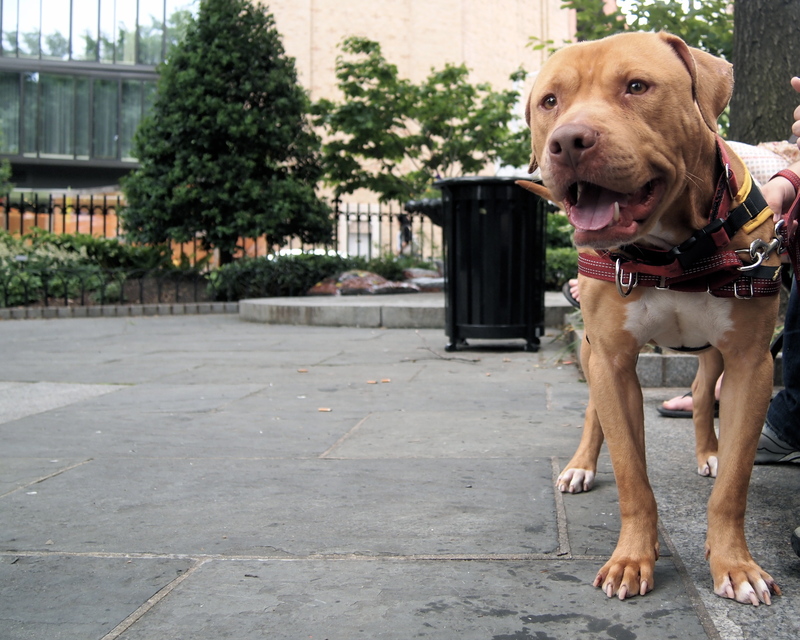 He was tied to a door, with no give, rarely walked, watered, or fed. He would lie in his own urine for hours at a time, until someone “felt” like cleaning it up. Now he is happy with all the attention he gets, but fears he will be abandoned when you leave him alone, and expresses himself by barking, but has not been destructive. Tigger needs to go to an owner who can work with his anxiety to help him overcome it. As the days go by, he seems to get better, but once moved from this environment, it could return. He was on medication for this as well, which helped him a great deal. He is not yet crate trained, but this does not mean that it is not possible for him to eventually enjoy being crated. If you’re interested in more information, please email us at bullyprojectnyc@gmail.com. 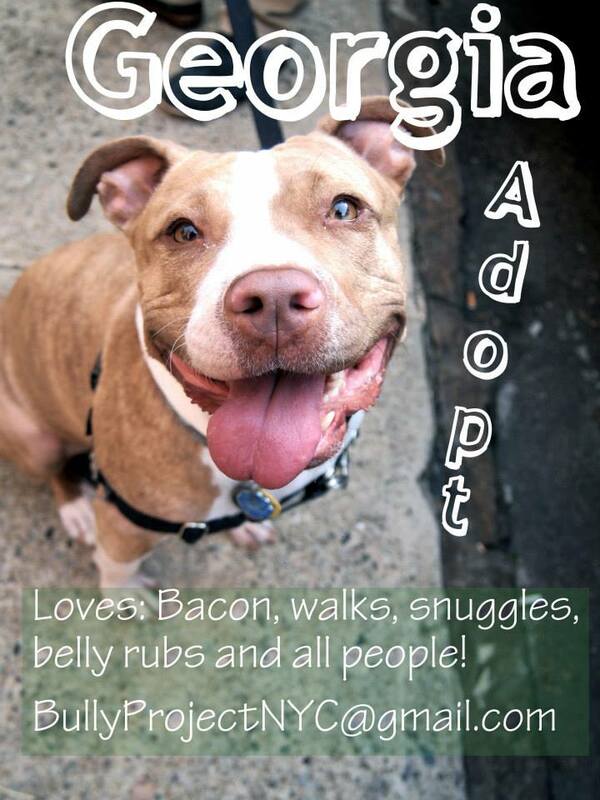 Georgia is our special adoptable this week. She’s a dog that’s been dealt a hard hand. 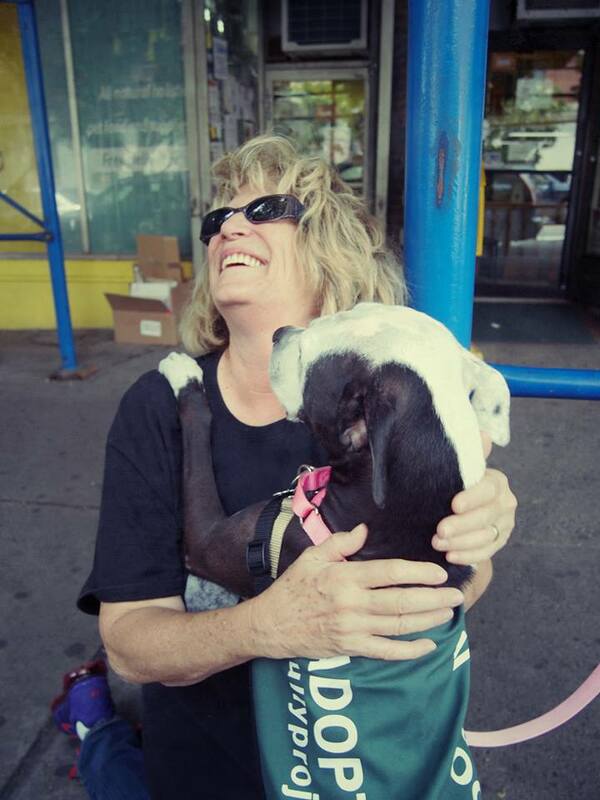 We first met Georgia (then named Sandy) when she was abandoned in front of a restaurant on Thanksgiving, 2011. The poor, scrape-ridden girl was cold and scared. 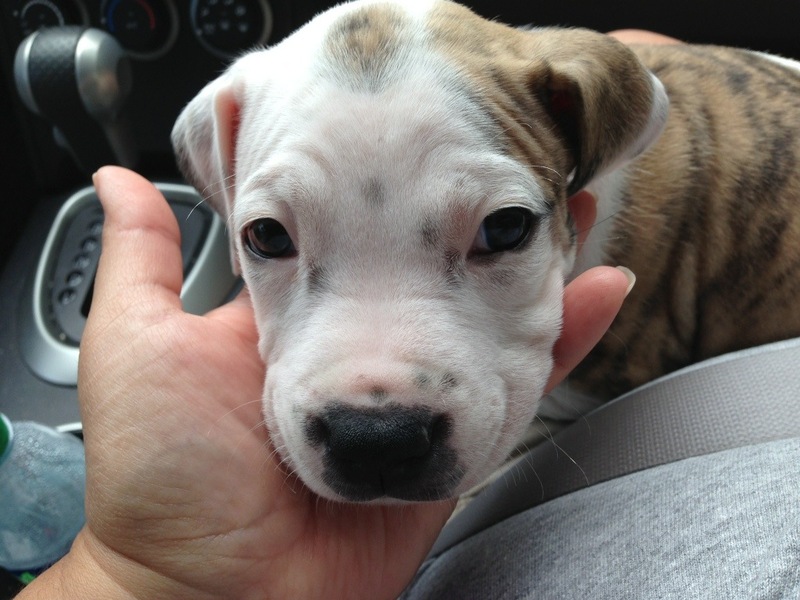 A local rescuer placed her in the ‘hood. 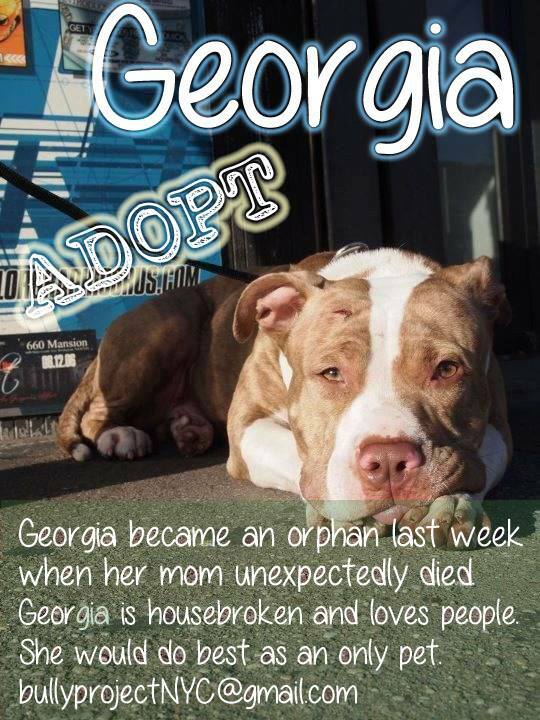 Her new mom named her Georgia and quickly showed her the world isn’t so bad, if you meet the right people! Georgia’s mom loved this little low-rider so much! The shy, scared pittie came out of her shell and became the biggest wigglebutt! Even now, with losing her mom and so many changes, Miss Georgia always has a smile! Once again, Georgia needs to help of a village…her mom recently died unexpectedly. 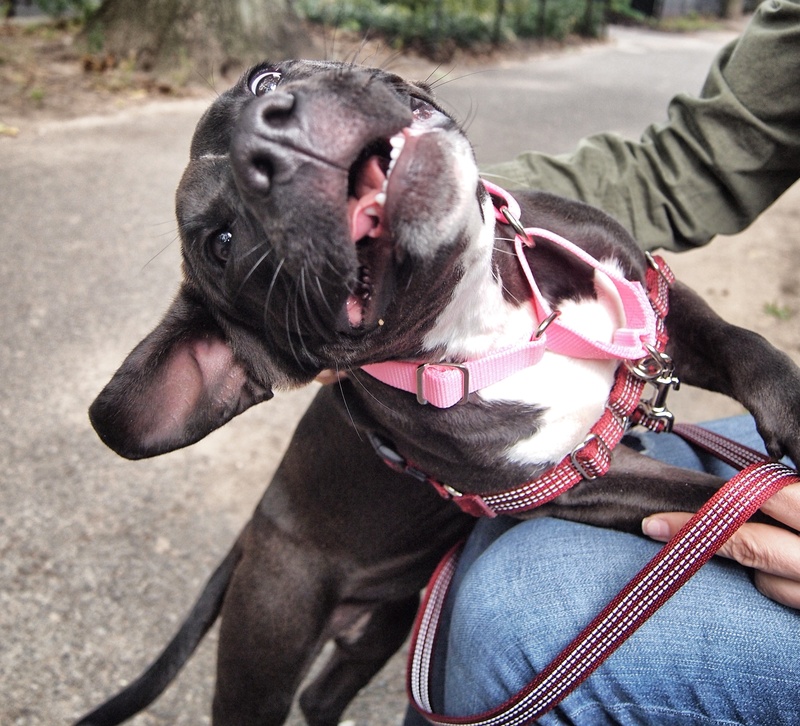 Bully Project is hoping to find a foster, or better yet, a forever home for Georgia. She adores people, treats, walks and snuggles on the couch. She would do best as a single pet. 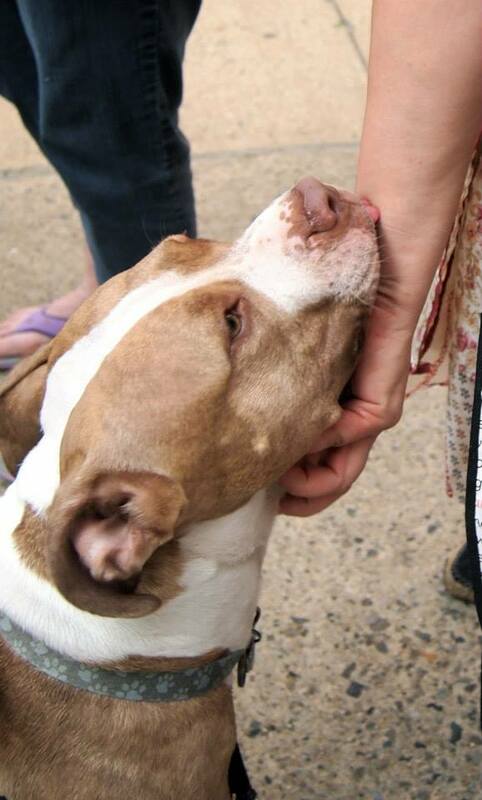 Please contact us at Bullyprojectnyc@gmail.com if you would like to meet this special girl! We promise you won’t be disappointed. 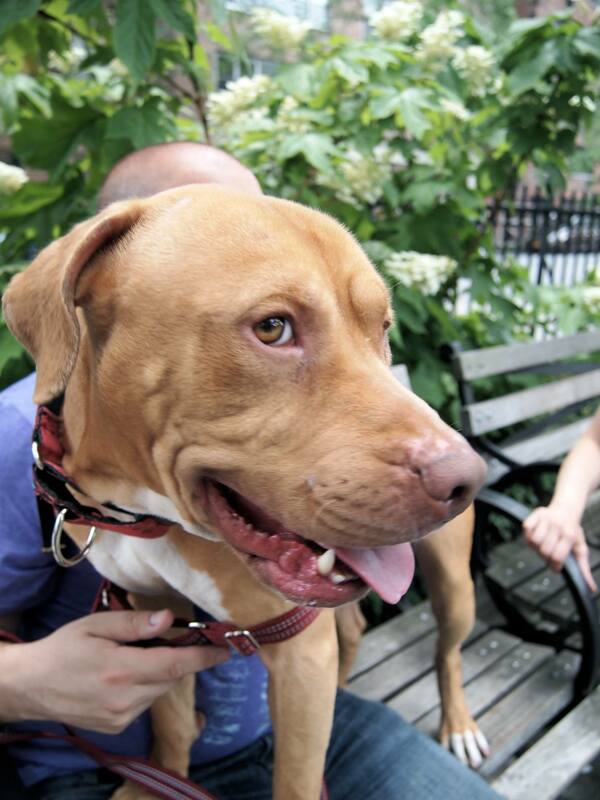 Chunk is still looking for a foster or an adopter. 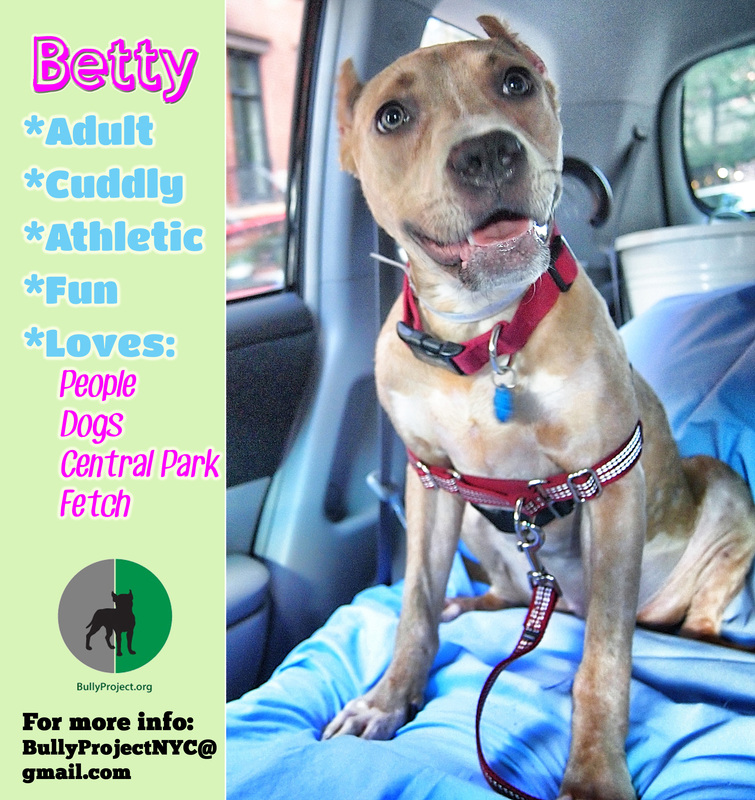 If interested, please email us at bullyprojectnyc@gmail.com. 66 lbs of love! That’s Chunk! This boy is as easy-going as you could ever imagine a dog being. He simply wants to be around people, and he’s totally content. 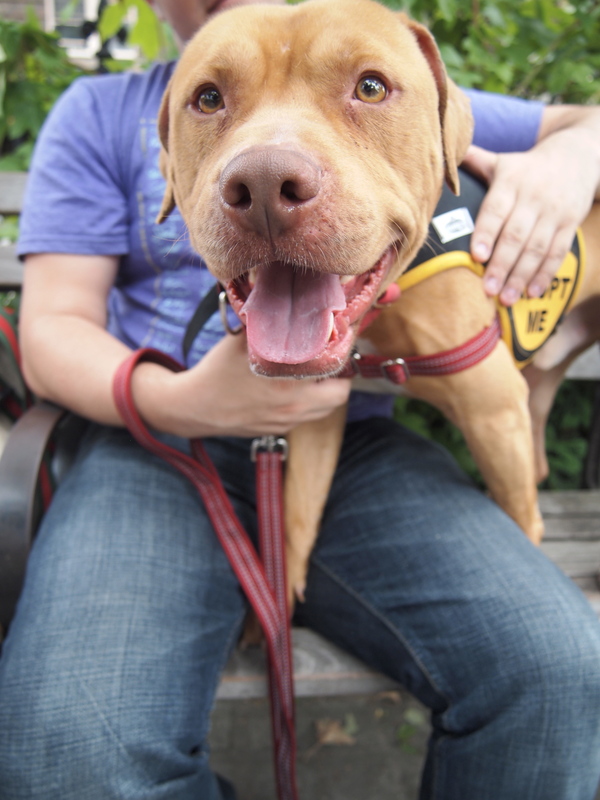 Though he may look like a big, athletic dog (which he is, of course), he enjoys spending most of his time getting head scratches, but scratches, eating grass, and getting as close to people as possible. He is approximately four years old, which means he’s already fully developed. So, what you see is what you get. You don’t have to worry about this boy’s personality changing radically, and he’s as big as he’s going to get. 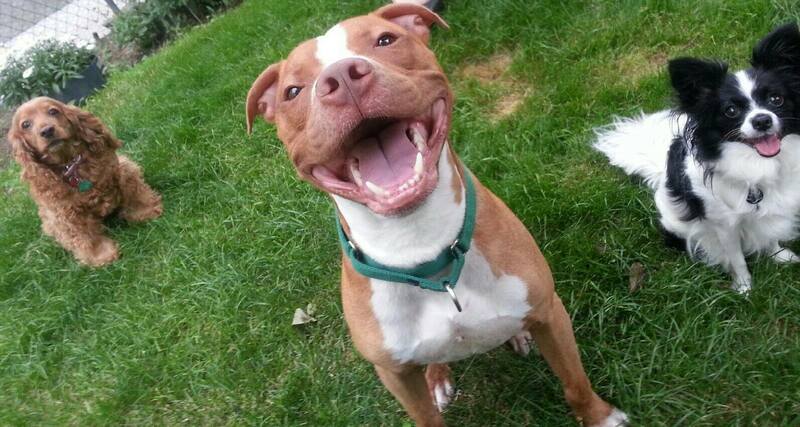 Chunk is currently recovering from a bad case of kennel cough, and as soon as he’s healthy, he will be neutered. 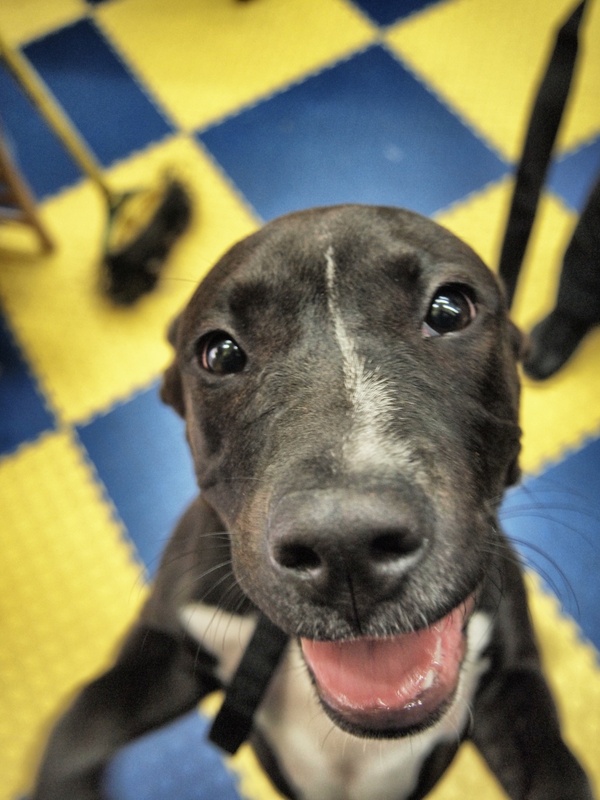 He is already fully vaccinated and microchipped, and ready for love. He seems to be friendly with dogs, but considering his illness is contagious, we are limiting his interactions greatly. It seems like he wants to play, but he is getting frustrated with not being able to actually do so. Hopefully, we can start to let him interact more soon! 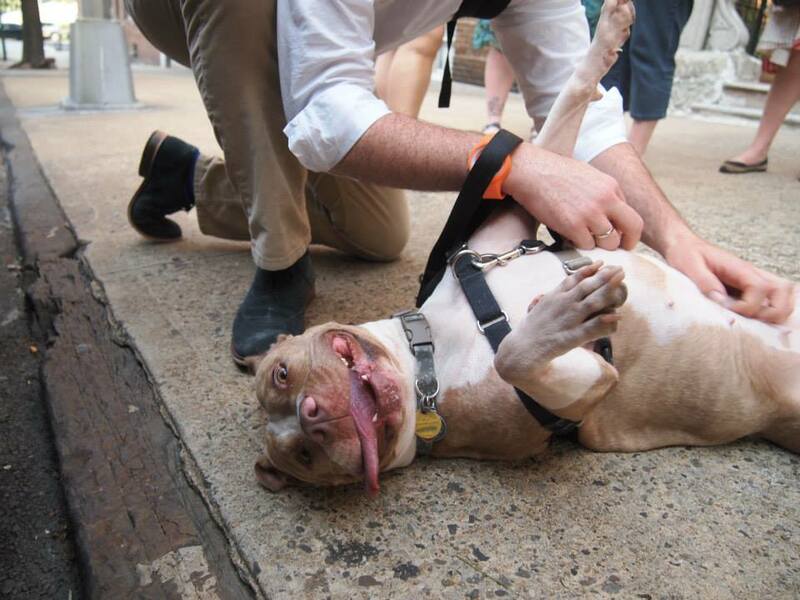 We’re still looking for a foster home for Chunk, or better yet, an adopter. 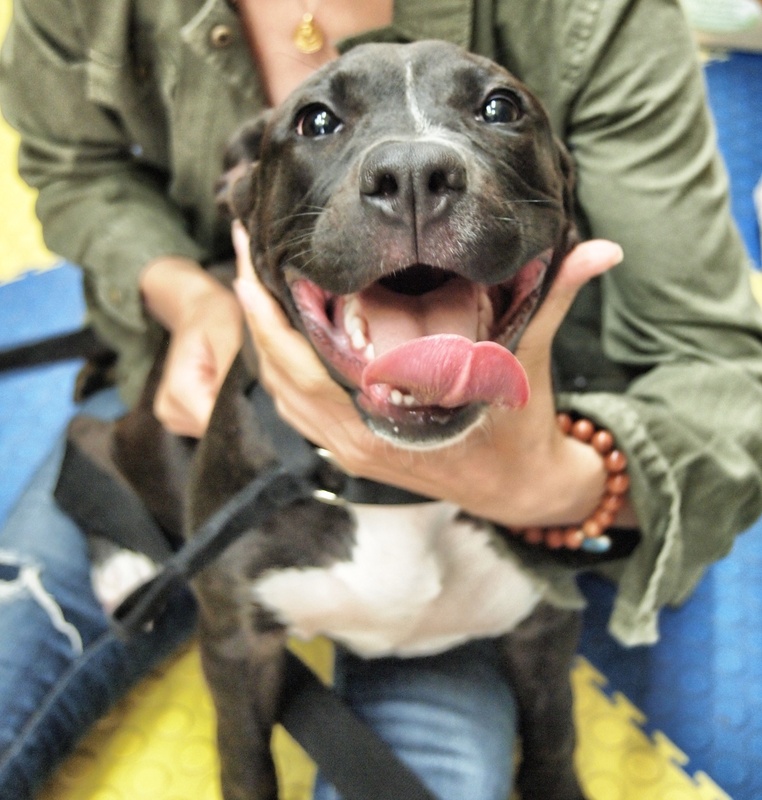 If you’re interested in being either of those for this sweet Chunk of love, please email us at bullyprojectnyc@gmail.com.